Earlier this year, we learned that Pluto’s heart-shaped region may have been formed when an asteroid the size of Manhattan smacked into the dwarf planet. Apparently, that violent origin story was just the beginning. Scientists now believe Pluto’s heart is so heavy that it caused the entire world to tip over millions of years ago. That’s the latest wacky hypothesis on our favorite dwarf planet’s most charismatic feature, which New Horizons researchers presented at the recent Lunar and Planetary science conference in The Woodlands, Texas. As New Scientist reports, the first clue that the Pluto we know and love may have suffered a terrible fall came from the observation that the west side of the heart—the smooth, crater-free surface known as Sputnik Planum—seems to line up perfectly with the tidal axis linking Pluto to its large moon, Charon. You can think of this axis as an imaginary line connecting two worlds locked in a gravitational embrace. 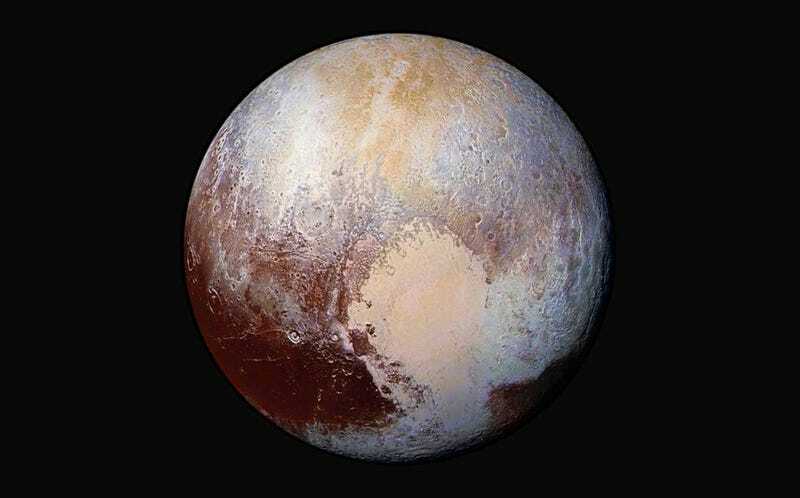 Sentimental folk may find it romantic that Pluto bears its heart at its celestial companion. But nature is cruel, and physics is unyielding. It’s more likely that Charon forcibly yanked Pluto into its present position, causing the entire planet to swivel hundreds to thousands of kilometers over millions of years. At least, that’s exactly what we’d expect to happen if Sputnik Planum is indeed denser than the rest of Pluto’s surface. And several teams of researchers now think that Sputnik Planum is unusually dense due to its thick coating of nitrogen ice, or because the region is swollen with water from the mantle. Same result either way: Pluto got clobbered, its heart grew heavy, and it tipped over. If anything, Charon was an accomplice. More work is needed to confirm the hypothesis. But if one thing’s clear, it’s that this little dwarf planetary system will continue to surprise us with its violent and storied past.